Not so Bloggy Meet-up for me. My Sister and I attended the screening of “One Week” last night thanks to Andrea. And I promised her no spoilers but, I will say that a) I miss my motorcycle terribly and b) Canada is an awesome Country. Thank you Andrea for providing us with a night out together, it was a great time. I am only sorry that we arrived a little later than the rest of the bloggers. Who were already in the theatre. My Sister had to work and got caught up in traffic so we arrived a little later than we had wanted too. I thought for sure I would recognize Chantal in the theatre, but I didn’t. There was a group of people that appears to perhaps be having lots of fun, so we thought it might be them, but there were no two seats near them so we had to grab two on the other side before they were gone. I guess I should have yelled out in the theatre, but somehow when I don’t work there it just doesn’t seem right. So a bloggy meet-up for me will have to wait for a little while longer, but I will recommend that you go and see “One Week”, it is a wonderful movie and both my Sister and I enjoyed it thoroughly. President Obama had a wonderful visit to our city or so they tell us. I, myself, got caught up in traffic on the way to lunch with some friends. Originally we were going to go to the Market, but changed plans due to road closures. I was able to see President Obama’s car drive by on a bridge ahead of me, it was a thrill. I got home and the Live press conference was on tv. I tried to listen but the phone kept ringing. 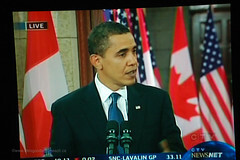 The most exciting part today was that President Obama made an impromptu visit to the Market, for yes, a Beavertail! He also stopped in a bakery and shook a few hands. All was a flurry on the Market as he was not expected to stop there at all. He will be the talk of the town for a long time to come. 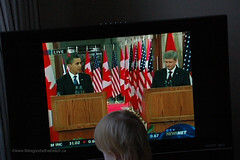 Thank you President Obama and I hope you and Prime Minister Harper had as great visit today as the reports are all saying.